The government sector and PSUs were, till recently, not very good investments. The reasons were many. There was an uncertainty about their future. The new Central government (well not new, now about 18 months in power) has undertaken a number of structural reforms that will slowly but surely improve the economy. Government departments, lead by motivated ministers, are gathering speed in terms of clearer objectives, faster decisions and accountability. Coordination issues among ministries are being sorted out. There are plans emerging for PSUs disinvestment, which will accelerate this process. The slogan is ‘less government, more governance’. They appear to be executing on this. In the light of this, JainMatrix Investments has prepared a report on a mid sized PSU. Based on our research, the PSU firm has a projected 80% gain in 2 years. This is however premium content, so we invite you to subscribe to our Investment service to receive this and other such reports. The updates of 26th EOD are: Overall 58% subscription with Retail 93% and Institutions 52% with FIIs also stepping in. HNIs are at only 3%. These are not great numbers. 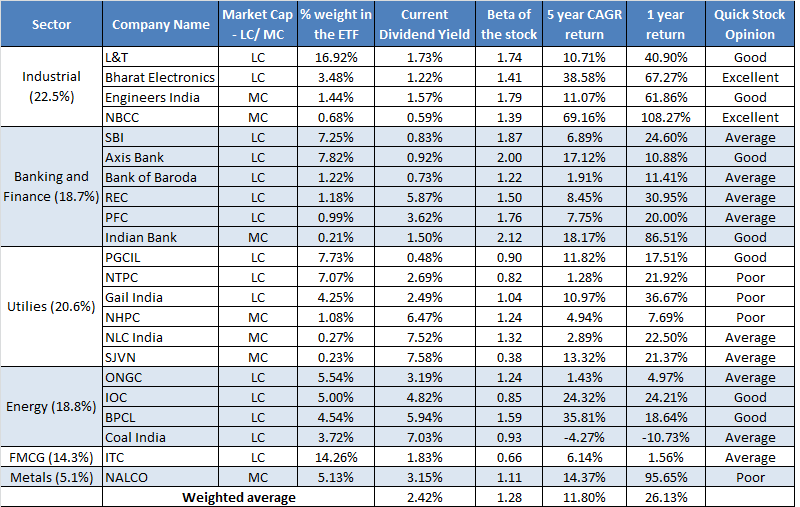 If limited to 2-3 times, then the IPO may list at the lower end of range. Retail applicants can apply accordingly. National Building Construction Co is owned by GoI /Ministry of Urban Dev. It provides Project Management Consultancy (PMC) for civil construction projects for Central and State Govt, civil infrastructure for power sector and real estate. Nationwide spread of projects address sectors like Hospitals (customer ESIC), Education Institutes, roads, irrigation, border fencing, etc. FY11 Revenues were Rs 3,127 crores, with Net Profit 140 cr and EPS 15.6. The net worth is 728 cr and it has an order book of over ~10,000 cr. Dividend yield is about 3-4% at current IPO pricing. However NBCC is a small PSU as it is a Nodal agency that essentially subcontracts work to contractors like L&T, Ramky Infra, etc. Here NBCC has back to back payments to contractors so that payments from customers are disbursed less margins. So debt is zero. Free cash on the books is 450 cr (35/share). NBCC has maintained ROE and ROCE of about 20% & 33%, in the last 3 years. The 3 years revenue visibility due to the order book is fine, and debt is zero. All India presence, with some international operations starting up too. The construction /infrastructure sectors are in a boom phase with terrific multi decade growth. The Indian government has placed infrastructure spending at a high importance, per Budgets/ Plans. A number of government depts are comfortable dealing with a PSU, and place their orders with NBCC. As a nodal Agency, NBCC itself does not possess project execution capabilities. The quality of output of NBCC is dependent upon subcontractors. In this current competitive phase for construction, top firms are ready to work for NBCC. Once these pressures ease up in the next 2-3 years, the quality will fall. In the medium term current subcontractors will themselves take up projects directly from govt departments, and NBCC will lose business. NBCC can be compared/ benchmarked against a number of firms. In Building construction, private sector firms are available at PEs ranging from 2-20 times with only larger high profile firms going over 6 times. In Civil Construction sector, large firms are in a range of 6-20 times, with the average at 14 times. Many firms in this sector are available cheaper than NBCC, offering ownership of a better business operation. My worry is whether the good-looking NBCC financials will hold up once it is a listed firm. The QoQ requirements of transparency of a listed firm are challenging, particularly for a govt department run PSU. Why does the government need to do an IPO for NBCC? This Nodal agency for construction should continue doing its good work for government departments. Why should the unsuspecting public be offered ownership in this business? 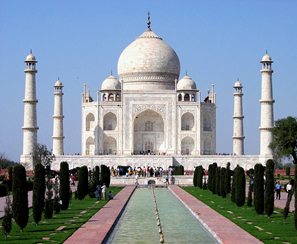 (One rumour is that the Indian Government is testing waters before larger IPOs. This firm is then a bad choice in my opinion). In the 60s, the Indian government owned/ nationalized firms like Banks, LIC, SAIL, BHEL, BEL, Indian Railways etc. so that they can manage them and invest large amounts in new capacity (no one else could). Today the Indian government suffers from a monopolistic, legacy oriented thinking, and a mistrust of the private sector. In these modern times, private operators are far more efficient, capable and technologically advanced than PSUs in the same sector. Private sector can invest in heavy industry. The government should in fact vacate from sectors where private sector can do a better job. NBCC is clearly in one such sector. NBCC has a poor competitive position in the industry. In the next 5-10 years, it will lose its relevance, unless it learns to compete against the private sector firms, and execute projects end to end. Offer is of 1.2 crore equity shares for 10% of the firm’s equity, in price range Rs 90-106, available from Mar 22-27th. At the upper end, this values the firm at P/E of 6.8 times, and it will collect 127 crores, and the market cap of the firm will be 1200 crores. Rating agency CARE has assigned a grade 4/5 to the IPO. It is of course possible that NBCC may offer a listing pop. Conservative investors looking for PSU firms and safety for next 1-2 years may like to Subscribe. Interested investors should watch the subscription numbers on 26 Mar and take their decision. Disclosure: It is safe to assume that if the JainMatrix website recommends a stock, the researcher has already invested in it. And vice versa. Petronet LNG is doubling capacities in the next two years. It provides a clean fuel, Liquefied Natural Gas to an energy starved country. Being a PSU JV, business risks are lower. The operational performance and capacity addition projects in the last few years have been excellent. It is a gem of a stock that will continue to give equity investors safe and high returns for the next few years. 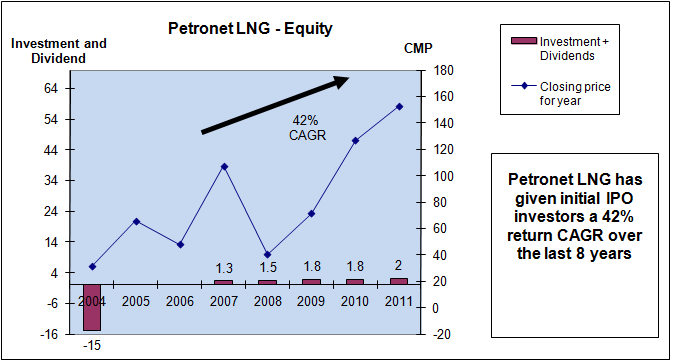 Petronet LNG imports, processes and sells LNG in India, and is a JV of GAIL, ONGC, Indian Oil & BPCL. Turnover in 2011 was Rs 13,197 crores with PAT at 620 crores. PLNG owns and operates a LNG terminal at Dahej, Gujarat that imports 10 mmtpa (Million Metric Tonne Per Annum) of LNG. LNG is sourced through long term contracts (with 7.5 mmtpa from RasGas-Qatar, 1.44 mmtpa from Exxon Mobil-Australia and 2.5 mmtpa from Gazprom) and also spot cargoes (sourcing 0.6MT in ’12 from Gaz De France) that boost volumes and utilize capacity. These contracts indicate stable supplies. Operational performance was excellent, with the FY11 LNG volumes at 11 mmtpa, a 110% capacity utilization at Dahej. The global prices of LNG have been rising. It depends on location, and today varies from 4$/mmbtu in USA to 15$/mmbtu in Japan. However, PLNG is protected from these prices, as it ensures back to back buying arrangements with customers. It earns a Rupee denominated marketing margin. PLNG is 26% promoter of a JV with Adani Enterprises, called Adani Petronet (Dahej) Port Pvt Ltd. This is a bulk Solid Cargo Port of capacity 12 mmtpa that has started operations this year at Dahej. Construction has started of an additional LNG jetty at Dahej which will take the terminal capacity from 10 to 15 mmtpa by Sept ’13. Construction of a new LNG terminal at Kochi, Kerala of 5 mmtpa, which will start by Sept 2012. Plan for forward integration into a power plant of 1200 MW capacity at Dahej using LNG fuel. A plan for building a LNG Terminal on the east coast of India. Location to be decided. Once the Kochi terminal is ready, PLNG may also invest in a power plant here, using LNG fuel. By FY16, total capacity could increase to 25 mmtpa, which is 2.5 times current capacity. Gas is a cleaner fuel than Coal and Oil. It burns completely. Usage of Gas is better environmentally than other fuels. Gas consumption in India is low compared to global patterns. PLNG is a pioneer that is creating the infrastructure that will improve gas usage and meet demand. Coal – while there are enough Coal reserves, Coal India has not been able to meet production targets. Their constraints are environmental clearances, logistic challenges, recent heavy rains in mining areas and labor issues. Other mine owners in India are also not producing enough; so many customers need to import coal. Also Coal is a dirty fuel. India is a crude oil importer and 70% of demand comes from this route. Oil prices are high. Nuclear energy has suffered a setback in India due to the Japan disaster. New plant construction is a political hot potato. Hydro and Renewables have a high cost of capacity setup. Indian gas demand is expected to reach 381 mscmd by 2015, compared with a current supply trajectory of 202.9 mscmd. There is definitely a huge demand for gas. Domestic supply of Natural gas from Reliance (Krishna Godavari), ONGC and Oil India wells has not scaled up and will not be able to meet above demand. Other LNG terminals are Hazira (Shell owned, 3.5 mmtpa) and Dabhol (GAIL/NTPC, ready by 2012). GAIL also procures LNG in long term contracts, and used the available terminal capacity (including PLNG) to import this. PLNG had its IPO in March 2004 priced at Rs 15. It was oversubscribed 4.2 times. At CMP of Rs 157 today, the stock has shown a 42% annualized return over the last 8 years! 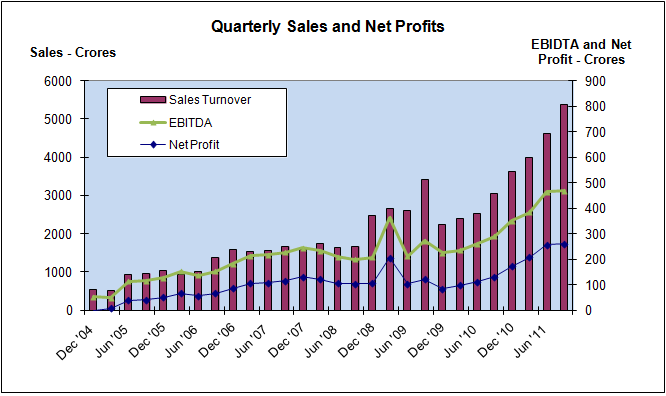 Revenues have grown steadily at 37% CAGR, (Fig 3), along with EBITDA – 35% and Profits 29%. 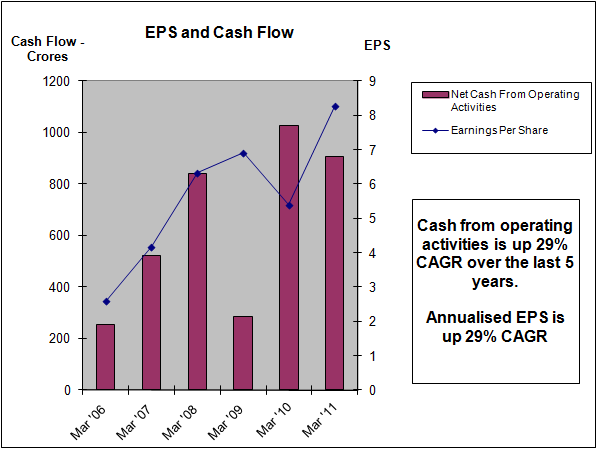 Cash flow and EPS are showing a robust growth rate – see Fig 4. A dip in 2010 was temporary, with a substantial recovery in 2011. Price and PE chart shows that PE has fallen recently close to the 5 year mean of 14 times. (Fig 5). PE today is 13.3 and has fallen 43% from 23 levels. During this fall, the price has only fallen 14% from the recent peak of 183 in Aug 2011. The rest of the fall comes from EPS growth, see fig 6. Price and EPS quarterly graph shows that EPS growth has accelerated in recent quarters. 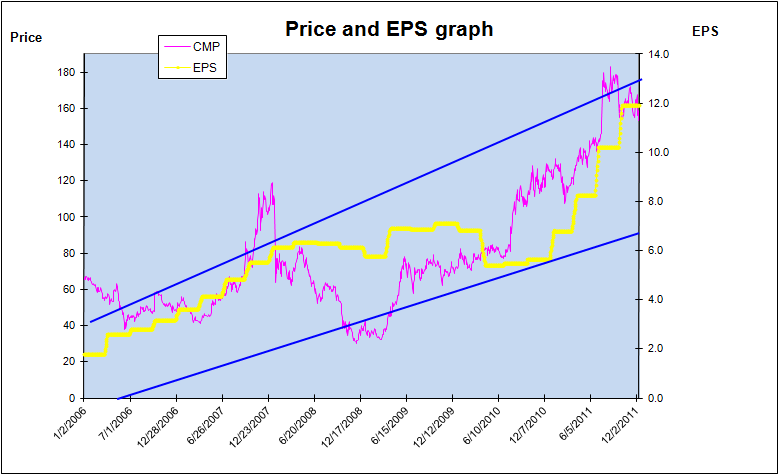 This elevated EPS will stabilize in 2012, and any further gains will come from interest cost reductions. Volume growth will happen in 2013 with additional capacity coming on stream in Kochi and Dahej. A global recession, perhaps involving a European country debt default, will depress the equity market overall, and PLNG also. But this even if it happens, will be a temporary condition. There has been a recent spurt in spot LNG price. This was largely due to the March 11 Japan earthquake and nuclear disaster; Japan has started idling their nuclear plants, and turned to LNG in a big way. In India, LNG demand is high, but may drop if prices exceed 18$/ mmbtu. However, spot prices in USA are at <4 $/mmbtu, so this is unlikely. US has low prices as they have started producing LNG from non conventional sources. Currently, LNG charges regasification tariffs are not under the purview of the regulator. Any policy decision to regulate the tariff may affect the valuation of the stock. PLNG has an excellent track record of investing in LNG assets and utilizing/ operating them well. In the last 8 years, all performance metrics of revenues, profits and EPS have improved to a new orbit every time capacity was added. Imminent capacity addition will replay this characteristic. Demand is huge in India, and as of now, all LNG import for the next 6 months are booked by customers. 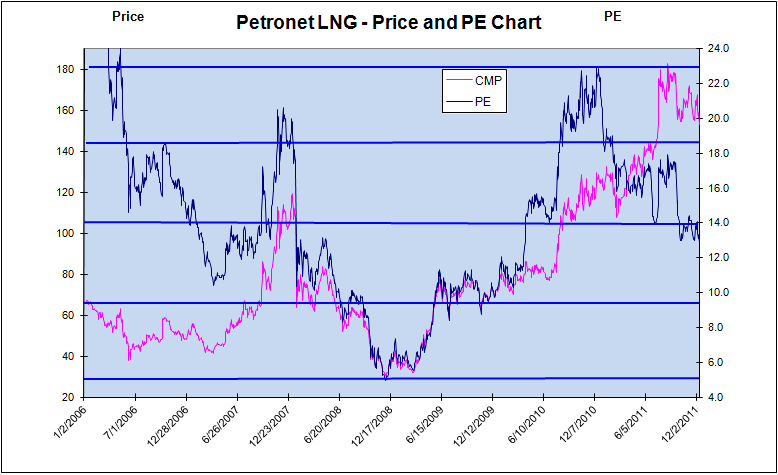 My opinion is that Petronet will continue down the path of solid stock performance and dividends over the next decade . The projections are based on PE expectations of 18 times.